This series by author Tsuina Miura and artist Takahiro Oba, originally started in magazine Manga Box in 2013 and now has migrated to the main magazine in issue 9. The story will continue from Manga Box and not restart like Kamisama no Iutoori or Real Account did. 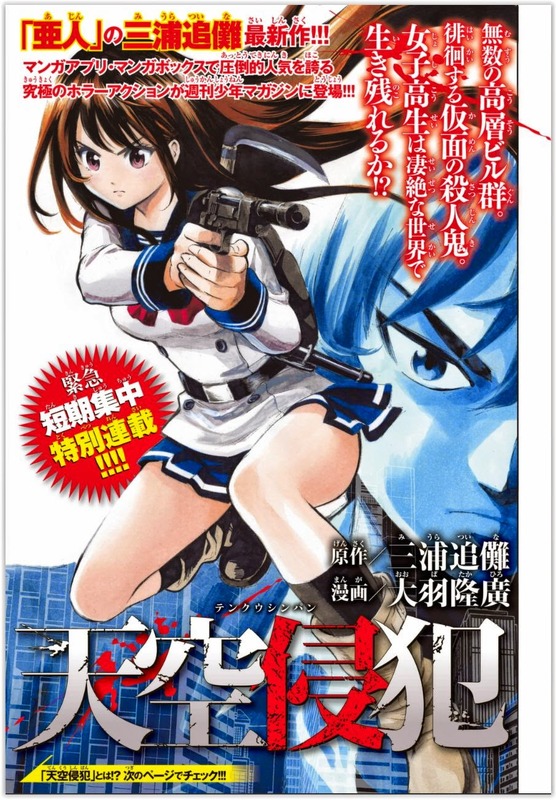 The first chapter shows a newcomer to the hellish survival game that everyone in this series seems to play (Japan sure love this kind of series...) and it helps us understand a little about this strange world dominated by skyscrapers. So whether readers are new to the series or not they can start from this point. This series does have the messy, gory and horrifying killings you are use to from other such series, but the difference is that it is more of a free-for-all rather than a hidden mysterious person pulling the strings.